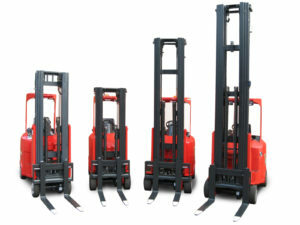 Narrow Aisle Flexi forklift trucks can dramatically improve the efficiency of a warehousing operation when compared to using a standard reach or counterbalance truck. This is because Flexi trucks allow you to fully optimize the warehouse space, reducing the space between the racks by up to 30%, because they have the ability to operate in, as the name suggests, a very narrow aisle width. Flexi trucks are designed to be easy for the operator to use; anyone who has experience operating a reach truck will not have any problem transferring to a flexi truck. However, it is important that your staff are properly trained to use flexi trucks, and in most cases conversion training takes less than a day. To help you out we’ve put together this handy flexi truck operator’s guide which shows the basics of flexi truck operation. Have your operators read this guide before they undertake flexi conversion training and you will significantly reduce the amount of time needed for training and practice. The basic controls of a flexi truck are similar to a standard forklift: there is a steering wheel with steering knob, lift/tilt/side-shift levers on the right-hand side of the steering wheel to control fork elevation, accelerator and brake pedals to adjust the speed along with a forward/reverse directional lever to alter the direction of travel. The difference lies in the way the vehicle operates – because flexi trucks have articulated forks, any steering inputs will move the forks along with the front wheels. This can be unnerving for new flexi truck operators, but with a little practice, it will soon become second nature. Now we’ve covered the basic controls it’s time to look at how to pick up and drop pallets. This is where the biggest differences are between flexi trucks and counterbalance or reach trucks. There really is nothing to worry about, if you follow these simple steps you’ll be up and running in no time. In fact, many operators find flexi trucks to be easier to handle than counterbalance trucks. Place your left hand on the steering knob and drive towards the load to be collected. If the pallet is in an aisle make sure you keep the truck straight and approach the pallet at a 90-degree angle. It is important that you keep the truck straight between the aisles, and at least 6 inches away from the rack on the opposite side of the load to be collected. This is to allow space for removing the pallet from the rack. When you reach the load to be collected line up the front wheels so the leading edge of the tyre is in line with the centre stringer of the pallet. Make sure the truck is still aligned in a straight line – this will allow you to collect the pallet without too much adjustment. Once aligned correctly, turn the front wheels 90 degrees towards the pallet without moving too far forward. This can be tricky to get right at first but with a little practice, you’ll soon get the hang of it. Once the forks are facing the pallet drive forward slowly, making steering adjustments as required to steer the forks into the jack openings without dislodging the pallet. 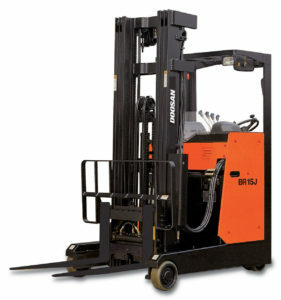 Use the lift/tile/side-shift levers if necessary to stabilise the load and ensure the forks are lined up correctly with the jack openings before removing the pallet. Place the truck in reverse and remove the pallet from the rack while applying steering inputs in the same direction as when entering the pallet. Once the pallet has cleared the rack, straighten up the steering and proceed forwards or backwards down the aisle. 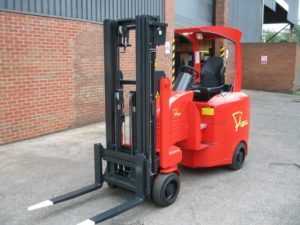 Operating a flexi truck is not all that different to operating a counterbalance truck and with a little practice you’ll soon be whizzing around collecting pallets at the same speed as you were before. For more information about our range of flexi trucks contact us on 01245 322252 or visit our website www.forktruckdirect.ltd.uk – We have a range of flexi trucks in stock to suit multiple applications, so we’re sure to have a truck suitable for your specific requirements.